In 1994, Roma Downey charmed audiences as Monica, the angel with a lot to learn, on CBS’s Touched by an Angel, and now, she is producing and starring in The Bible. Her husband, Mark Burnett, has made a name for himself as a successful television producer. Here, we will examine this creative duo’s career path and the different projects they are both involved with. Roma’s best-known role was in Touched by an Angel. In the series that ran from 1994-2003 audiences got to know Monica, Tess, and Andrew, a trio of angels sent to earth to tell depressed and troubled people that God loves them and God hasn't forgotten them. Roma’s next notable role was in The Division, in which she starred in three episodes as Reagan Gilancy. The Division ran from 2001-2004 and followed five female cops in San Francisco as they struggled with their personal and professional lives. Throughout her acting career Downey also executive produced TV movies such as Breach of Trust, Second Honeymoon and The Survivor’s Club. Downey’s last work as an executive producer before The Bible was in 2004 when she worked on Funky Monkey. Burnett made his producing name with Survivor, a reality show where a group of contestants are stranded in a remote location with little more than the clothes on their back. The lone survivor of this contest takes home a million dollars. Burnett’s career as a producer ramped up after 2007 when he began working on Are You Smarter Than a 5th Grader? Burnett executive produced 70 episodes of the quiz show, which ran until 2010 and featured adult contestants and questions directly from the textbooks of first through fifth graders. In 2011-2012 Burnett executive produced 16 episodes of the series The Voice. In this show, four famous musicians including Adam Levine and Christina Aguilera search for the best voices in America and mentor these singers to become artists. America decides which singer is worthy of the grand prize. Downey and Burnett finally came together to produce The Bible. 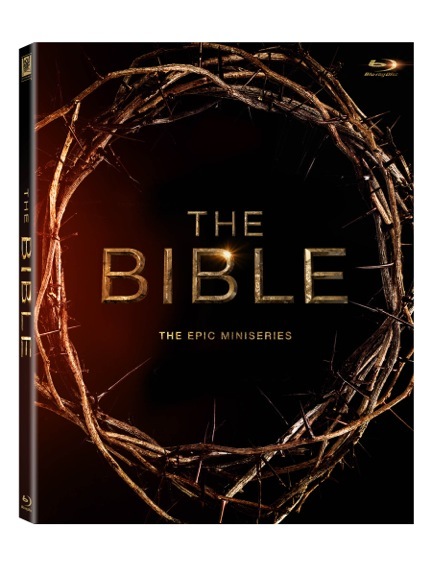 This 10-hour, five-part, mini-series will tell some of the best-known stories from one of the most popular book in human history, from Noah's Ark and the Exodus to Daniel in the Lion's Den to the crucifixion and resurrection of Jesus. This will be the first time they have produced together and the first time that Burnett has produced a series in which Downey stars. Do you want to win a bluray copy of this miniseries? I'd love to see the "The Bible". Thanks for the chance to win it. I would love to get to watch this. Thanks so much! I didn't know about Roma Downey's involvement. Very interesting. Haven't been able to watch it all on tv, would be nice to own. It sounds so interesting. I would love to watch this with my family. Thanks for the chance to win it. I haven't had the opportunity to watch the entire series yet, but I have four of the episodes on my DVR. I've watched the first two. It is pretty amazing. Thank you so much for sharing and for the opportunity. I watched a series special on ET and more than ever I would love to own it. The actors involved are pretty awesome as well Thank you for the opportunity. I'd love to watch this!